Turning 21 is to be celebrated – especially when you’ve been entertaining the masses for over the last two decades. An excellent host, 21 years on the Arches continues to throw the most fabulous, unmissable events month-after-month. If you haven’t enjoyed any of their festivities, where have you been? Thankfully, it’s not too late to crawl from under that rock and discover the many wonderful revelries on offer. Whether it’s enthralling club nights and gigs, exhibitions or performances of every variety, it’s all waiting for you. And if you dare to get involved, you can channel your inner artist and try out a new idea in front of an audience at an upcoming scratch night or take your chances at the interactive Alien Wars. Not for the faint of heart; you have been warned. 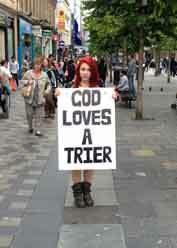 From 18 – 29 September Arches Live will be showcasing innovative and intriguing new work by Scotland’s emerging artists. This year’s festival is bigger, better and bolder – and not to be missed. With over 30 performances to choose from in a two-week span, there’s something for everyone, myself included. Victoria Bianchi’s God Loves A Trier, exploring our ability (or lack of) to see things through to the end; Fire Into Song, featuring the talents of Cara Berger, Victoria Beesley and Vanessa Coffey that introduces a female Prometheus and promises to be different each night – and the voyeuristic Minotaur/Monitor . Calum MacAskill’s short, thought provoking experience gives insight into the life of the half human, half bull. ‘Live feed’ begins at 6pm. If you’re taking in a few shows, you may want to consider getting a festival pass (£32/26) or a day pass (£18/12). So go on discover, dance and be merry. The women’s intraleague roller derby is about to kick off with aptly named home team Hells Belles against Death Stars. Queuing outside Glasgow Caledonian University ARC gym with the growing crowed, we watch the competitors wander in and out. There’s a distinct dress code: shiny, sparkly hot pants, tattoos and badges. Clearly I’m overdressed. Finally inside we pay (£6 for adults and free for children under 14 – hooray!) and make our way towards the seats – apparently at our own gamble. Sit here at your own risk is taped to the floor of the benches we’re sitting on. Unphased by the warning, my husband claims this danger bench is the best spot where we’ll be sure to see the most action as women gather speed and ram into each other. The track consists of three oval paths, inner for the referees, middle for the skaters and an outer path for the skater fallout. And there’s a lot of fall out. We watch the glistening Lycra-clad ladies do the rounds warming up racing round the track, barging and jinking through each other. My boys conduct a slightly different warm up tucking into homemade cakes and drinks. The commentator introduces us to the energy-charged ladies whose possible areas of expertise are reflected in names like Whisky Galore & Luisa Bruises. And then the derby starts. 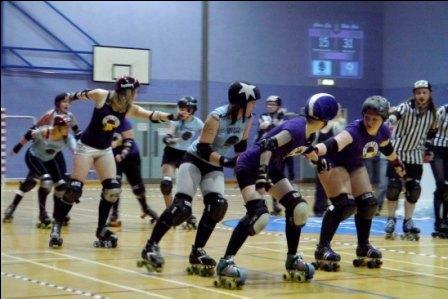 I suppose the concept is rather simple – a sport played by two teams of five (I think) members roller-skating in the same direction around a track. And yet, not that simple at all. This is a contact sport. An exciting, thrilling, exhilarating ride-on-wheels wrapped up in tight-fitting-don’t-mess-with-me-garbs. The whistle blows and I watch gripped by the two teams on the track as one woman from each team works her way her way methodically through the pack to complete circuits of the track and score points. All the while the rest of the team block, barge and charge each other to knock the opponent off course from their star-helmeted team mate. Body pads and helmets are well used as skaters hit the deck all over the place. In a word this is fantastic. 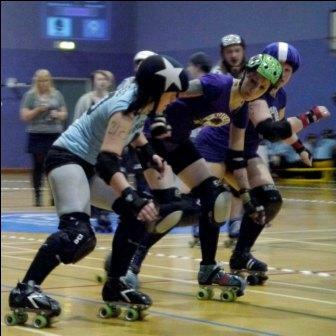 I enjoy myself so much that along with my youngest son, I cheer (some may say loud whooping) for the home team Hells Belles – although my eldest is won over by the Death Star’s theme tune – Star Wars. Scoring is fast and furious at the end of each session; 15 to 5 becomes 15 to 30 which becomes 60 to 30, the lead changes hands frequently but the Death Stars beat our Hell’s Belles to a place in the final on the 12 November against the Bad Omens. Get your heart-rate racing and add a different spin to your Halloween. Check out the next match on Saturday 29 October – it’s a Monster Bash with local and international games kicking off at 12:30pm.